Math problems are everywhere when solar power is concerned, not only for reducing power losses, but also for safety considerations. Article 690 of the National Electrical Code (NEC) requires deratings and correction factors based on the type of wiring involved and the locations the wires are installed. There's also a default "just because it's solar" calculation with a lot of good reasons related to the NEC's goal of life safety. I installed my system using the 2003 edition, which was the current edition at the time. And from the 2008 version. My area's coldest daytime winter temperature is usually above 20F so my weather correction factor would be 1.13, but I've seen 30 mph winds on bright sunny winter days, so I'll use the higher number to allow for windchill. The PV Source Circuit Current is then multiplied "because it's solar" by 1.25. 8.541A times 1.25 = 10.67A. This is the maximum possible current that each circuit could possibly produce. If I selected only a 10 amp fuse for this circuit, there is a strong possibility I'd have to replace fuses pretty often in the winter time, especially on bright sunny days with lots of snow reflecting even more light onto the solar panels. The wire size has to be able to handle 125% of the derated PV Source Circuit Current (10.67A), so 10.67A times 1.25 = 13.3A. Our wire has to be thick enough to handle 13.3 amps, so either of these sizes would meet the electrical code. If these 10 these circuits are running through conduit, then the rating for 10AWG (40A > 23.2A) is reduced yet again. 23.2 times 0.5 = 11.6 amps. I can either run 9 circuits in conduit and run 1 circuit free (allowed with USE-2 cable) and derate the circuits in conduit to 70% (16.24A), or divide the runs, with 5 circuits per conduit and derated to 80% (18.56A). Something else to consider is resistance. Thinner wires have more resistance than thicker wires which reduces the amount of power available at the end. And, the lower the voltage, the greater the power loss. I have fairly short wiring runs (less than 50 feet). The following table shows the calculated voltage drop (loss) for a 50' circuit, at various DC voltages, with a 10 amp load. The voltage drops even further on longer runs. At 12 volts, a 500' circuit loses so much, that it's only 2.4 volts at the opposite end! PV Source Circuit Current times number of circuits times 1.25 (twice) equals PV Output Circuit Current. 7.3A times 10 circuits = 73.0A times 1.25 = 91.25 times 1.25 = 114.06 (we'll round up to 115A). 7.3A times 5 circuits = 43.8A times 1.25 = 54.75 times 1.25 = 57.03A (we'll round up to 60A). 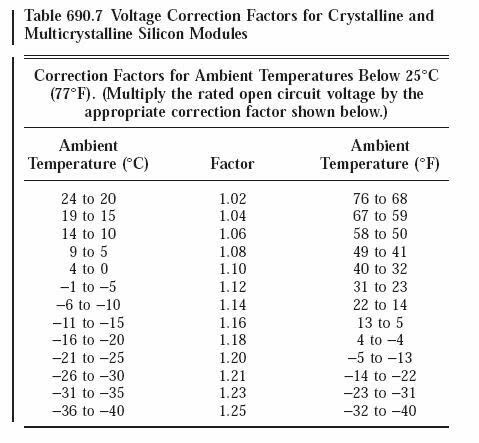 sum of the maximum voltages (Voc) of panels wired in series, times the weather correction factor. 66.4 + 66.4 = 132.8 volts, times 1.13 = 150 volts, which is way over the 125 volt limit. If I need higher voltages in the future, I may be able to rewire the panels and mix them with 24V panels. Assuming the 24 volt panels have a maximum voltage of 44.2 volts (like the BP 3160 solar panels): 66.4 + 44.2 = 110.6, times 1.13 = 124.978, which is right at the 125 volt charge controller limit. Of course, I would also have to keep the source circuit currents in mind as well. From this point (the combiner box) to the DC equipment inside the house, everything is calculated for 60 Amps. I'm planning on adding more solar panels on the southeast facing portion of the roof, which will start collecting power a couple of hours earlier than the southwest facing panels. The expansion will require another combiner box, probably with 2 more PV Output circuits, so the conduit will be sized accordingly. We can use 3 AWG wire, but 2 AWG provides less power loss (and is usually readily available and in stock at most do-it-yourself places). An equipment ground wire is also required, and its size is based on the size of the largest breaker (60A), BUT if the wiring on the PV Output Circuits has been oversized (like ours), then the equipment ground wire also has to be oversized to the size of the PV Output Circuit wires. Eventually, there will be 4 PV Output circuits plus the equipment ground wire running in conduit from the roof. We're using 2" conduit which has room for a total of 12 wires (if they're all 2AWG). There are many types of conduit, but not all are approved for use in the outdoors where rain and sun are present. Rigid metal conduit (RMC) and Intermediate metal conduit (IMC) are approved. Liquidtight is approved if it's sunlight resistant. Schedule 40 PVC conduit is also approved if it's rated sunlight resistant, but I've still seen it deform in normal summer temperatures. Electrical metallic tubing (EMT) is not approved for outdoors where exposed to weather, and Schedule 80 PVC conduit is not approved for outdoors where exposed to sunlight. Where multiple wires are installed in conduit, the cross section of the wires is only allowed to fill up to 40% of the cross section of the conduit. The cross section of #2 AWG THWN wire is 0.1158 square inches. The cross section of nine wires is 1.0422 square inches. The conduit fill tables in Chapter 9 of the NEC specifies that 1.5" RMC allows up to 0.829 square inches, and 2" RMC allows up to 1.363 square inches.